The Tear Drop Butterflyfish has a white body outlined in bright yellow on the fins. There is a large black dot below the dorsal fin that fades downward into a teardrop. There is a black vertical band across the eyes and one at the base of the tail fin. 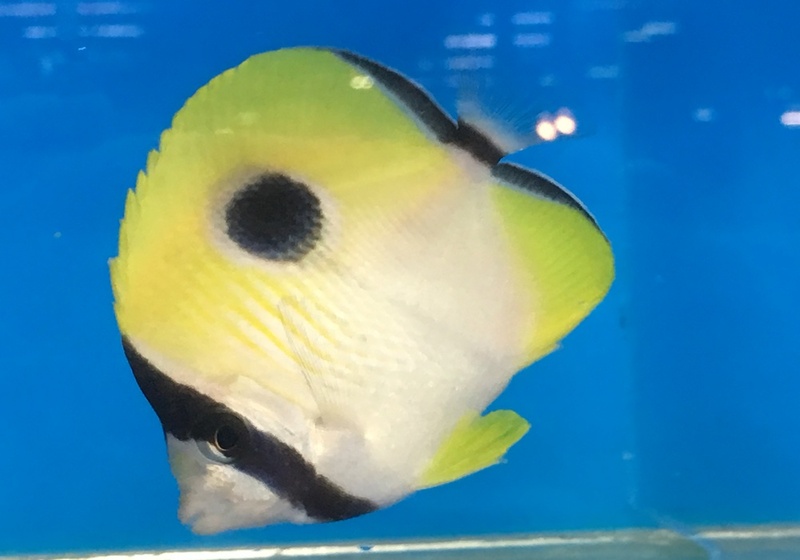 This Teardrop Butterflyfish is hardy and acclimates well to the aquarium environment. They will eat most foods offered and do well in a fish-only tank with peaceful tank mates. Have lots of good swimming area and live rock for grazing and shelter. Will nip at corals and invertebrates with their powerful jaws and are not recommended for a reef tank. To initiate feeding, offer a variety of small frozen foods such as mysis shrimp, enriched brine shrimp and cyclopeeze. Train your butterflyfish to eat Formula One Small Pellets or Flakes for a healthy diet.